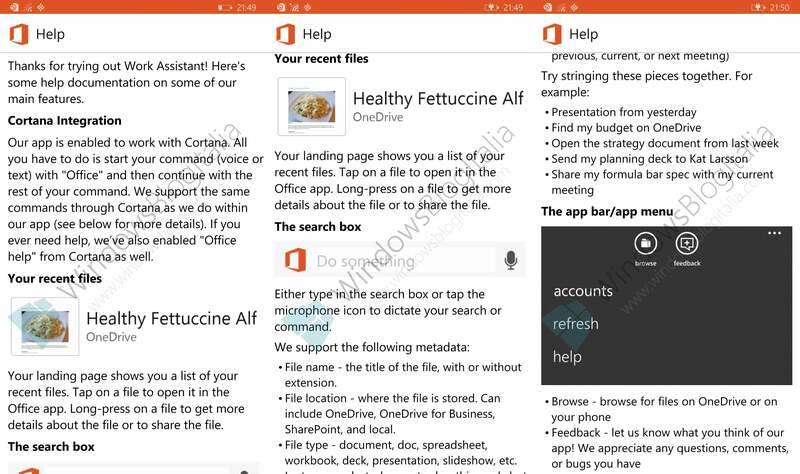 Rumors of incoming Cortana integration with Office strengthened over the weekend after screenshots of the Microsoft's mysterious Work Assistant app leaked online. The prototype version of Work Assistant, a Windows Phone Store app limited to internal Microsoft beta testers and discovered by WMPowerUser on Friday, is said to integrate natural language voice commands with Microsoft's Office apps to help you find, share, and edit documents easily—and it may be the first step towards Cortana's eventual invasion of the Office suite. The impact on you at home: Cortana is quickly becoming one of Microsoft's marquee features across its product line. The smart assistant debuted on Windows Phone and is officially slated to come to Windows 10 later in 2015. Adding Cortana to Microsoft's productivity platform is the next logical step, especially on mobile devices where speaking to your device comes more naturally. Whether people are willing to ask Cortana to fetch their TPS reports on a desktop PC, however, remains to be seen. 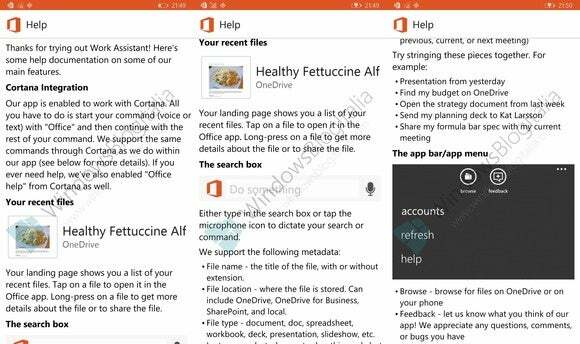 WindowsBlogItalia's alleged Work Assistant screenshots detail Cortana integration. It's also unknown if Work Assistant is intended to be a separate app or if this is just how Microsoft is testing voice command integration with Office. Work Assistant could, for example, be fully integrated with Office on Windows Phone instead of existing separately from the work suite. The primary function of Work Assistant appears to be a method of searching for Office documents. You can search by names, location, file type, and when the file was last opened, according to Windows Central. Work Assistant knows to search across multiple locations including local storage, OneDrive, and SharePoint servers, according to the leaks. That sounds very similar to the search commands Microsoft's Joe Belfiore used to showcase Cortana integration in Windows 10. 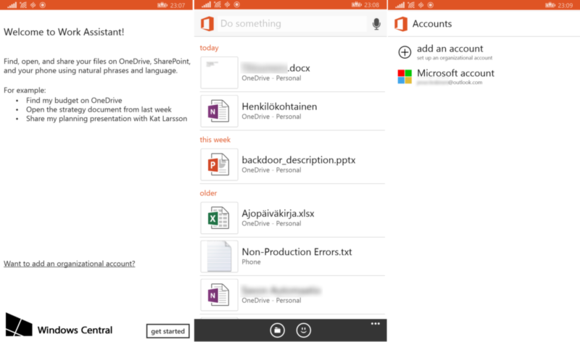 Leaked screenshots of Work Assistant for Windows Phone. Beyond searching, you can use Work Assistant to open, view, or edit a document, as well as share it or send it in an email. Work Assistant may also integrate with your calendar and be able to share a document with all invitees listed at a current meeting. For now, it appears Work Assistant is only being tested on Windows Phone—at least publicly. It will be interesting to see if this kind of functionality also shows up on other mobile platforms where Office exists, including Android and iOS. Hit Windows Central and WindowsBlogItalia for the full spectrum of Work Assistant screenshots.